Professed "Jersey girl" Christeena Hockin-Minopetros began collecting sea glass from the New Jersey shore when she was 5. She recalls that when she was younger, before the glass became scarce, you could walk home with a bucketful after a day at the beach. Now, 10 months after Hurricane Sandy hammered the Atlantic coastline, the Florida resident says she's shocked by how many of the frosty relics she found while walking along Sea Bright Beach back home this summer. "It's everywhere," Hockin-Minopetros said, explaining how she found two large bags of sea glass in a variety of hues: brown, white, blue, milky green and a "gorgeous" red piece she can't take her eyes off. We can thank Sandy for the finds, said coastal geologist Cheryl Hapke. "This is an epic summer for a collection of beach glass," she said. 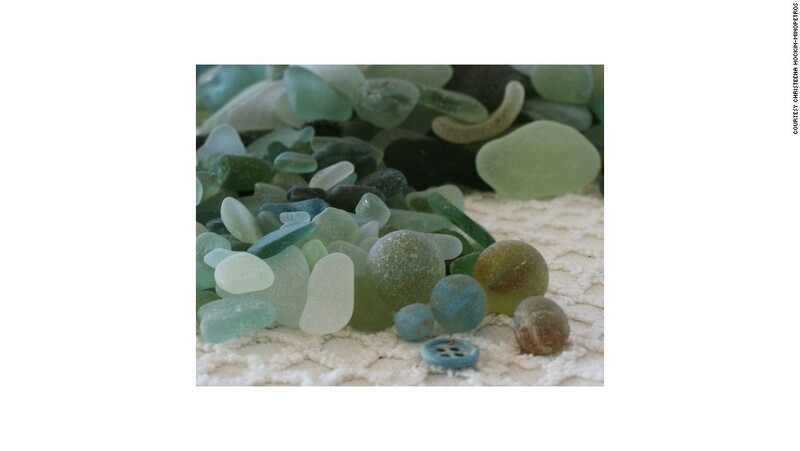 Sea glass, or beach glass, begins essentially as garbage -- broken glass dumped into fresh or salt water. Over time, waves, water and sand smooth its sharp edges. It's the smaller pieces of sea glass that usually get brought onto shore for people to pick up, Hapke said. 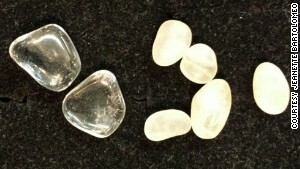 Sea "diamonds," both before, right, and after polishing. It's well-known that hurricanes erode seashores and hamper tourism, but, according to Hapke, a storm like Sandy -- which boasted record-high waves in late October -- can filter larger, coarse materials from the seabed and wash them onto the shoreline. That's good news for beach-side businesses that sell their finds. As Sandy swallowed beaches and deterred patrons, businesses in southern New Jersey's Cape May Point suffered, said resident Jeanette Bartolomeo. Her son-in-law's Sunset Beach Gift Shops, where Bartolomeo works as the jewelry manager, were among the few fortunate. Never mind the sea glass; Bartolomeo's eye is drawn to the "Cape May Diamonds" -- clear quartz pebbles that, when polished, resemble real diamonds -- and Sunset Beach Gift Shops are known for their collection. The pure quartz pebbles, which break off from pockets of quartz crystal in the upper reaches of the Delaware River, have always been in abundance, but bigger pieces churn up after a storm. That's why Hurricane Sandy and the February nor'easter were "a blessing," Bartolomeo said. "Thank God they keep coming in," she said. Though Sandy didn't damage Cape May as much as other parts of New Jersey, many residents and visitors assumed beaches and shops there were closed, so Cape May tourism suffered and business was slower than usual, Bartolomeo said. "We had people calling, 'Are you open now?' " she said. "But we were never closed." Gov. Chris Christie's administration announced last week that every public boardwalk and beach along the New Jersey shore is now open, after 10 months of renovations and "beach replenishing." 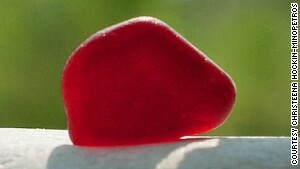 Red sea glass is rare, Christeena Hockin-Minopetros says. Bartolomeo said she's already seen an increase in tourists this summer at Sunset Beach, where visitors can be found scouring the beach for the quarter-size "diamonds" washing up on the shore. Despite the good news for many businesses, Hockin-Minopetros is concerned that beach replenishing -- by which sand from other areas is used to revitalize an eroded beach -- might affect the abundance of sea glass, much like she worries construction and spiking insurance rates along the coast could affect the shoreline's pristine quaintness. "I'm afraid New Jersey's shoreline will be one big McMansion, and that saddens me deeply," she said. In addition to the sea glass she collects to craft into jewelry, which she sells, Hockin-Minopetros also keeps a personal collection of about 500 "really fantastic" pieces, most of which she collected while living in Greece. But her best piece is one she picked up in Point Pleasant, New Jersey, she said. The heavy, 8-inch-long, clear glass is actually a deck prism, which sailors used in the upper deck of a ship to illuminate the ship's passageways below deck. It's one she won't be selling, she said. "I only keep the real unusual," she said.